The price, too, is just too high. If you're determined to spend around £1,700 on a gaming notebook, the MSI GS70 Stealth is a more rounded package. Toshiba's Qosmio gaming laptops have never been shy about showing off their high-end heritage, and that's certainly true of the new X70: it's got a ring of red metal around its base. The same material is used to circle the touchpad and the power button, and the keyboard is illuminated with the same bright colour. The bright, anodised borders contrast well with the aluminium used to create the rest of the 3.4kg Toshiba. The metal is dark, finished with a pattern made of small diamonds, and is used on the wrist-rest and lid. The Qosmio logo on the lid is large and metallic and lights up when the machine is turned on, and the chassis is 44mm thick – which puts it into the top tier of gaming notebooks. The Qosmio has a suitably high-end specification to match the garish exterior. This gaming behemoth is powered by an Nvidia GeForce GTX 770M, which is one of Nvidia's most powerful mobile GPUs. 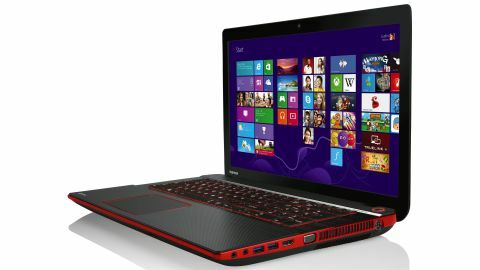 It's supported by a Core i7-4700MQ processor and 16GB of RAM. A 256GB SSD is used as the boot drive, and there's a 1TB hard disk to house an extensive library of high-end games. The screen is standard fare in the realm of high-end gaming notebooks: a 17.3-inch panel with a Full HD resolution. The Qosmio is designed to attract attention from potential buyers, but this laptop has also attracted plenty of competition. The MSI GS70 Stealth is a gaming notebook with a 17-inch screen, but it crams high-end hardware inside a chassis that's 2.7kg in weight and just 22mm thick – dimensions that make the Toshiba seem chubby. The Asus G750JX is a superb all-rounder with a suitably high price, and then there are 15.6-inch models in the former of the Schenker XMG P503 and Gigabyte P25W – machines with huge power in slightly smaller designs.